Lookin' hopeful! My fingers are crossed that soon our yard will be violet-free. And seriously, how pathetic does our mailbox look? Between the dried up stump, torn up yard (thanks to the mail lady--see that dirt trail over to the neighbors?) and the leaning mailbox post--ugh, can ya get any more ghetto that that?! So that's definitely getting some attention soon. Here's my dream mailbox. Yeah, that's right--I have a dream mailbox. No, but seriously, isn't it really nice? And This Old House even has a plan to make that gorgeous post. Okay, I might need some help from Mitch with this one. And on a totally unrelated note--I must be tired/completely out of it 'cause today I took Ryder to the bathroom at church and totally walked right on into the guy's bathroom. I even looked at the urinals and everything and didn't really think anything of it. It wasn't until he was actually using the facilities that I realized what I had done. Thank goodness no one walked in! Can you imagine? "Hey, Pastor, how's it goin'?" I guess my train of thought was: Ryder is a boy so he needs to go to the boys' room. Sheesh. Please tell me you've done something completely stupid recently. I can't be the only one. just one thing stupid? BTW - Dad says that you can eat the violet leaves - just put them in the garden! those violets are hard to get rid of! LOVE the new mailbox inspiration tho! I've never heard of those violets. It hasn't rained in so long here and combined with the 100 temps I am sure they would die anyway. lol. 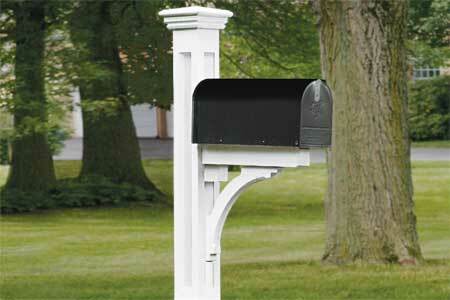 My parents have a mailbox just like that one but it has a little flower box on the back. It is so cute!